Accelerator - 1% Cobalt is added to resin or gel coat to increase cure times. Also available.. 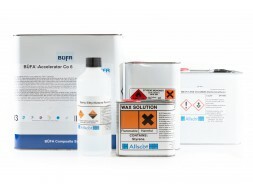 Accelerator - 6% Cobalt can be added to resin or gel coat to increase cure times. Also available ..
A general purpose methyl ethyl ketone peroxide (MEKP) used for curing our polyester resins and gel c..
Styrene Monomer is an additive for reducing viscosity i.e. thinning of resins and gel coats for..
Wax solution is a paraffin wax additive for resin and gel coats which when added to the final l..